The Golden Gate Bridge, hanging gracefully on its cables over the wide, dark blue strait between the city of San Francisco and the green and brown hills of Marin County, exemplifies construction excellence. Observing its 70th anniversary in May 2007, the Golden Gate is not only one of the world’s great engineering feats; it is one of the most beautiful bridges anywhere, whether slowly emerging from the fog at sunrise, spanning the blue waters in the mid-day sun, bidding adieu at a golden sunset, or twinkling in the night. Each year, millions of people throughout the world gaze at its solitary wonder, from the top of a hotel on Nob Hill, or from an outdoor table at a restaurant in Sausalito across the bay. The bridge, like the Parthenon in Greece and other world wonders, fits the setting perfectly. Prospectors on their way to look for gold in the hills of California named the strait, which connects the Pacific Ocean with San Francisco Bay “The Golden Gate.” Capt. John Fremont, explorer and surveyor for the U.S. Army also is said to have given it this name in 1946 because it reminded him of a harbor in Istanbul named Golden Horn. The mind-boggling idea of spanning this entrance to San Francisco’s harbor enticed people’s imaginations for years. San Francisco was growing fast, and Marin County, 1 mi. across the water, had tremendous potential. Connecting the two would be a huge boon for the entire area. San Francisco was the largest American city still served primarily by ferry boats. Lacking a permanent link with communities around the bay, the city’s growth rate was below the national average. Bridging the strait, however, was a daunting challenge. Many engineering and construction experts said the bridge couldn’t be built. The strait is 6,700 ft. (2,042 m) wide. It’s really a gap in a mountain range, a gorge fronting directly on the Pacific Ocean, producing strong, swirling tides and currents, with water 335 ft. deep at the center of the channel, and almost constant winds of 60 mph. The bridge would be broadside to ferocious winds and would often be surrounded by blinding fogs during construction and operation. It also would be within 12 mi. (19 km) of the geological fault whose shifting had rumbled through San Francisco in 1906, shaking down bridges and thousands of other structures. No bridge had ever been built before at a harbor entrance; the structure would have to be tall enough to allow the largest ships to pass underneath its deck at high tide. A bridge across the strait had been proposed as early as 1872, but the idea gained strength when James Wilkins, editor of the San Francisco Call Bulletin, strongly advocated it in 1916, when citizens were still fired up from the San Francisco World’s Fair the year before. San Francisco’s city Engineer Michael M. O’Shaughnessy enthusiastically backed the idea, too. He asked Joseph B. Strauss, a noted engineer who had built approximately 400 bascule bridges (including the city’s 4th Street Bridge), to address the problem. Strauss, who headed his own company, Strauss Engineering Co., proposed in 1921 to span the gate with a combination cantilever and suspension bridge, without the sweeping beauty of today’s Golden Gate. In his vision, towers approximately 1,320 ft. (402 m) from each shore would rise 777 ft. (237 m) above the water. They would be connected to the shore by cage-like cantilever frames, and would support a cable suspension bridge stretching 4,000 ft. (1,219 km) from tower to tower. His design was, in effect, a massive bascule bridge with a suspension span replacing the usual drawbridge or movable arm. It was ponderous, without the sweeping lines of a suspension bridge. 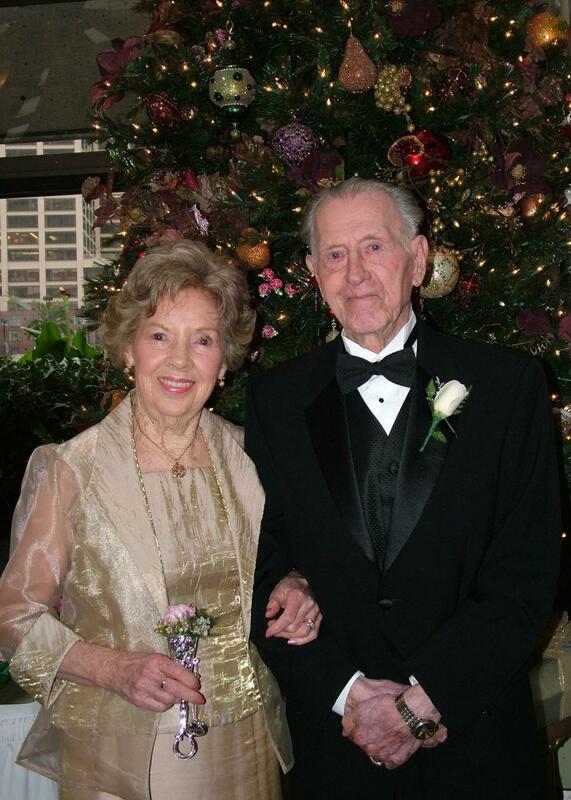 Strauss gave O’Shaughnessy a cost estimate of $27 million, far below the $100 million estimated by critics. 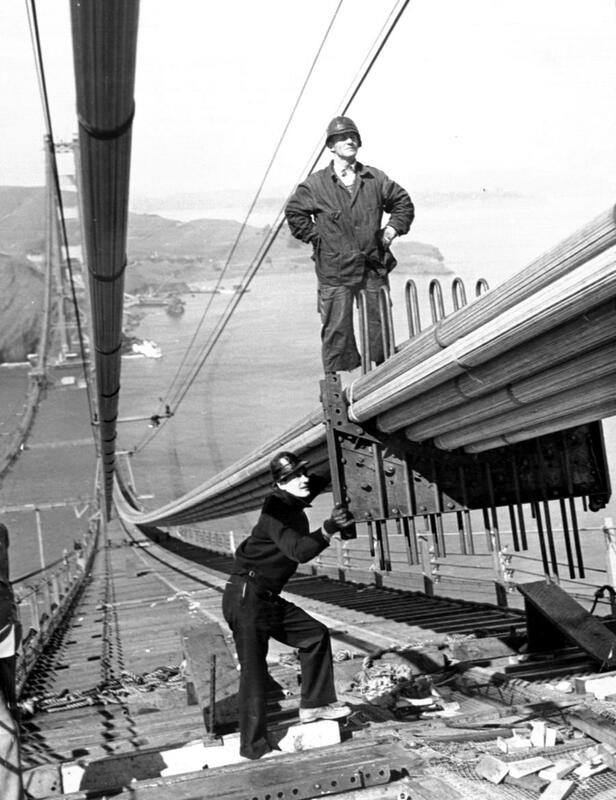 The Golden Gate Bridge project slowly gained momentum during the 1920s. As population grew on both sides of the bay, and traffic congestion at the ferry docks became worse, Strauss talked up the proposed bridge at dinners and meetings, and got the support of some political and financial leaders. No federal or state funding was available, so the California State Legislature enacted the Golden Gate Bridge and Highway District Act in 1923, giving counties the right to organize, borrow money, issue bonds, construct a bridge and collect tolls. The War Department, whose jurisdiction included all harbor construction, issued a provisional permit in 1924 despite objections that the bridge would hinder navigation. In 1928, The Golden Gate Bridge and Highway District was formed to direct financing, design and construction of the span. It included San Francisco, Marin, Sonoma, Del Norte and parts of Mendocino and Napa counties. This district still oversees the Golden Gate. The board representing the counties met for the first time on Jan. 23, 1929. It selected Strauss as chief engineer of the proposed bridge on Aug. 15. His fee has been called “the lowest ever written for a bridge job of such magnitude” — 4 percent compared to a standard 7 percent at that time. The board also named an engineering board of consultants to work with Strauss. It included Leon S. Moisseiff, designer of the Manhattan Bridge over the East River in New York and the Philadelphia-to-Camden Bridge (now called the Ben Franklin Bridge). It also included Charles Ellis, a former professor of structural and bridge engineering of the University of Illinois, who, as a Strauss Engineering employee, was Strauss’ personal representative on the board. Ellis and Moisseiff put their heads together and proposed a suspension bridge far more beautiful and efficient than the original Strauss design. It would be the world’s longest, and highest, suspension bridge up to that time. An expert on wind stresses on bridges, Moisseiff showed that the main cables could absorb as much as half of the wind pressures and transmit them to the bridge towers and abutments. With the suspenders properly adjusted, the bridge would be flexible enough to bend and sway with the wind. As the Strauss Engineering design engineer, Ellis, working without today’s computers, devised new algebraic formulas and calculated such factors as the stresses, which each of the bridge’s hundreds of suspender ropes would bear. 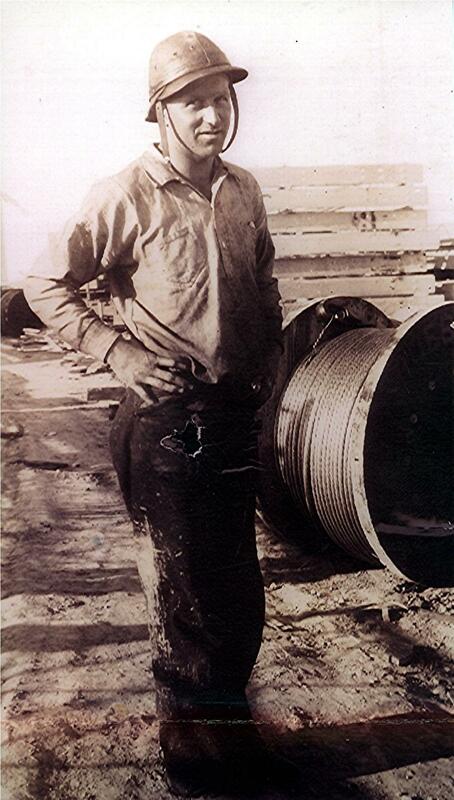 He produced the company’s material specifications for the towers and other bridge elements, taking into account deflections from wind and other weather. The bridge’s two towers, the tallest ever built up until then, followed the basic design of Moisseiff’s Philadelphia-Camden Bridge, completed in 1926, which featured large steel-cell cross-members, each set within a rectangle. The Golden Gate followed this design below the roadbed, but modified it above the deck to great open rectangles without cross-members, framing the blue sky and producing a lighter look. The towers were indented as they rose in an art deco design which further lightened the bridge’s appearance. Vertical “fluting” on their surfaces augmented this upward thrust. The bridge’s cable design, spun, wire by wire, by three carriages that moved back and forth between anchorages, was similar to the Brooklyn Bridge (and would be done by the same contractor, John A. Roebling Sons). 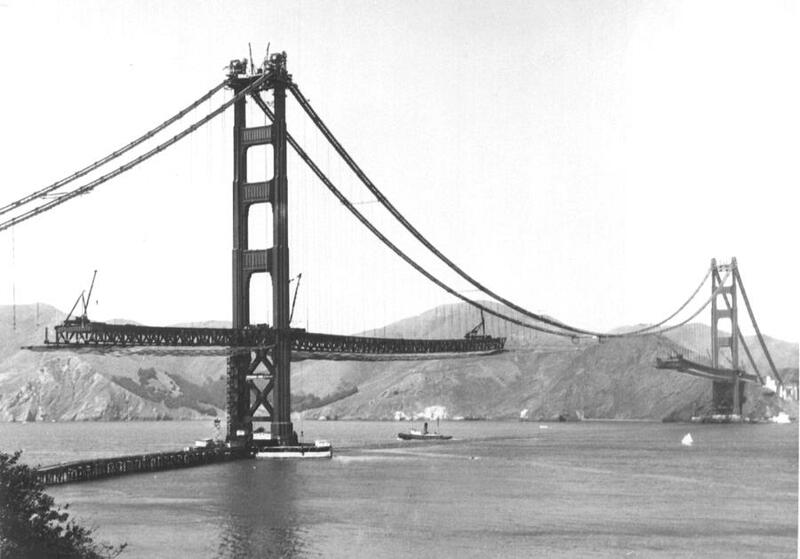 The War Department issued its final permit for constructing the Golden Gate on Aug. 11, 1930. Strauss submitted final plans to the board on Aug. 27, and voters within the district elected on Nov. 4, 1930, to support a $35-million bond issue to finance the bridge project. Some put homes or business properties up as collateral. Supporters won by a vote of 145,697 to 47,005. The stage was set for one of the nation’s largest construction projects. In the midst of the Depression, it was an important statement of faith in the future. Eleven of the nation’s leading bridge engineering firms submitted proposals for building the Golden Gate. A total of $23.844 million in contracts was awarded in November 1932. Construction began on Jan. 5, 1933. The largest contracts were awarded to McClintic-Marshall Corp., which had bid $10.494 million for the steel superstructure; John A. Roebling Sons ($5.855 million for the cabling), and Pacific Bridge Co., $2.935 million for the towers on the San Francisco and Marin County sides of the bridge. The immediate challenge was to build the anchorages and the two 747-ft. towers for the suspension cables. 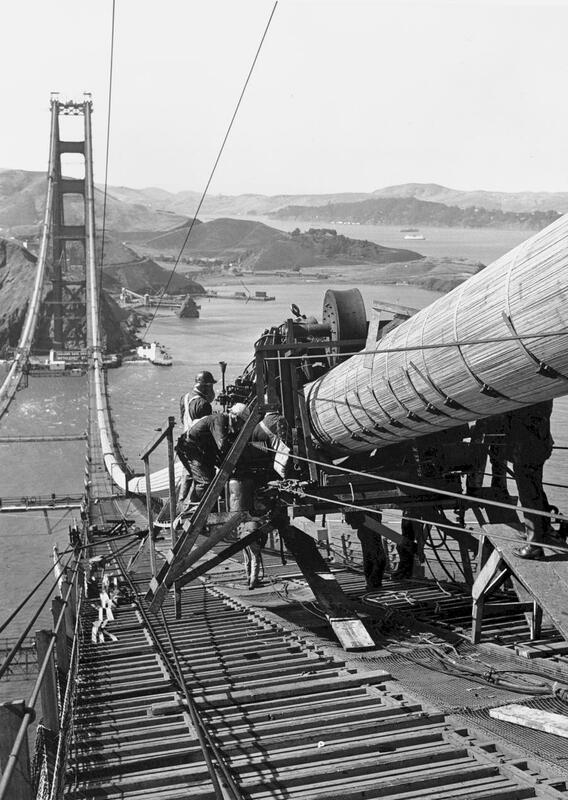 Workers blasted large excavations on the Marin and San Francisco sides to accommodate the enormous pylons and anchorages that would guide and tie down the bridge’s giant cables. This work — on the scale of building a stadium — required enormous amounts of concrete, with separate batching plants on each shore. The anchorages were begun in 1933 and completed in 1936. The tower on the San Francisco side, reached by an “access trestle,” was placed 1,100 ft. (305 m) from shore. On the Marin County side, the tower was on the shoreline. Pacific Bridge lowered 30-ft. (9.1 m) thick concrete fenders to enclose a space the size of a football field and form the base of the San Francisco tower. Construction workers pumped an estimated 9.7-million gal. of water from the fender. The Marin tower, built on land, set steel base slabs into a concrete foundation. Cranes then lifted steel-cell sections, which were riveted atop one another as the tower rose. Steel sections for the towers were fabricated at Bethlehem Steel Company plants in Pottstown, PA, and Steelton, PA, shipped by rail to Philadelphia, and then sent by boat to San Francisco via the Panama Canal. The Marin Tower was completed in October 1934, and the San Francisco Tower in June 1935. Each contained approximately 600,000 rivets. Now the cabling work could begin. The Golden Gate was built using Roebling’s loom-type spinning carriages, with two main cables passing over the tops of the towers and then going down to giant anchorages at either end. A total of 80,000 mi. (128,747 km) of wire was used in the two cables. Each cable included approximately 25,000 wires, compacted into 122 strands. 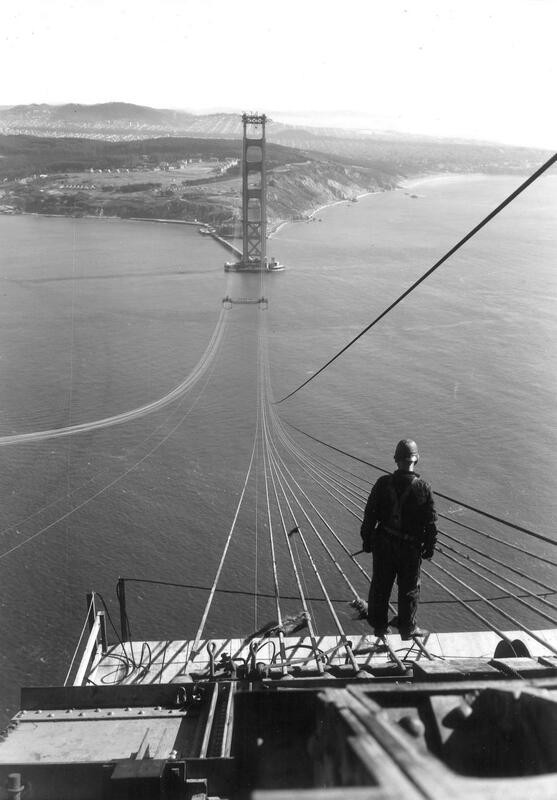 The suspension cable work was completed in March 1936. The roadway steel was then completed the same month and a 7-in. (17.8 cm) concrete deck, placed over the steel, was completed in November 1936. The Golden Gate Bridge, on schedule and below budget, was approaching completion. 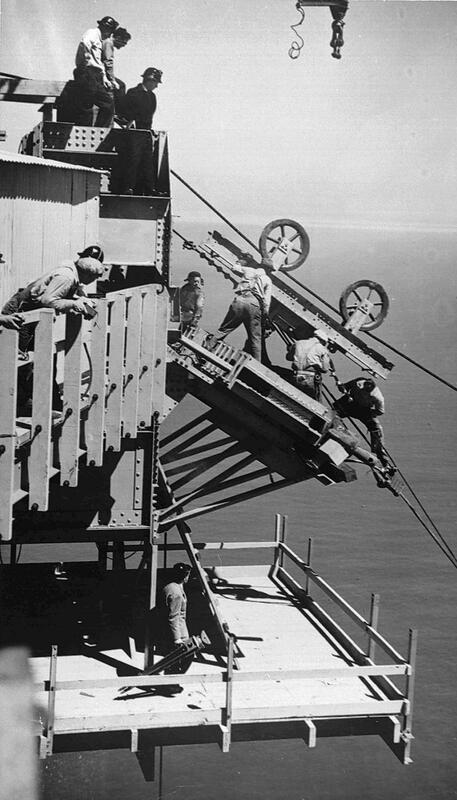 It had the best safety record of any large bridge until, on Feb. 17, 1937, a 5-ton work platform fell into a large safety net, which slowly collapsed 220 ft. into the water. Ten workers, entangled in the net, perished. The entire bridge was painted orange-vermilion, called “international orange,” to blend with the natural setting. This was obviously a much better selection than the black with yellow stripes the Navy wanted in order to assure greater visibility for passing ships. Low-pressure sodium roadway lights were initially installed to give a warm glow to the bridge at night, without glare for passing motorists. In 1972, these were replaced with high-pressure sodium vapor lamps to improve the amount of light, while preserving the warm glow by means of a plastic amber lens. Lights also were installed on towers, piers, cables and the midspan. The Golden Gate Bridge, 1.7 mi. long with a central span of 4,200 ft. and six 10-ft. wide lanes, was opened to pedestrians on May 27, 1937. An estimated 200,000 people walked, ran, roller-skated, and stilt-walked across the new span. The next day was the official opening to vehicles. After President Franklin D. Roosevelt pressed a telegraph key announcing this opening to the world, car horns, sirens, bells, whistles, cannon and other sounds of celebration filled the air around the bridge. Approximately 400 Navy biplanes from three aircraft carriers thundered overhead, a parade of official cars, flags flying, crossed the span, and a huge fleet of 19 battleships and heavy cruisers, plus three carriers and hundreds of other ships, sailed beneath the bridge into San Francisco Bay. Today, the Golden Gate Bridge, in her graceful strength, continues to symbolize the nation’s enduring spirit.